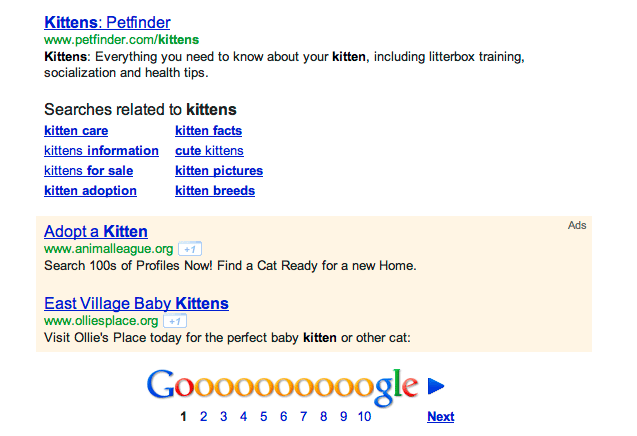 Google has announced, just this week, that they will now display ads at the bottom of the search engine results page. As with any major change to the search results pages, this update has been rolled out after extensive tests. Google has been running tests on this project for some time now, and has come to a final decision in this regard. The decision to include ads at the bottom of the search results pages has been based on the fact that they find the performance of ads at the bottom of the page to be better than the performance of ads that run alongside the search results. This improved performance is probably due to the fact that users scan a search results page from the top downwards and not from side to side. Hence, when they reach the bottom of the page, they automatically see the ads displayed at the bottom. On the other hand, it is very likely that they might miss the ads that happen to be on the side of the results page, partly because they are not directly in the page scan path and partly due to acquired “banner blindness”. Organic results at the bottom of the page have been known to typically have higher clickthrough rates than ads in the second-last position. These results will now more than likely get fewer clicks, with such traffic instead flowing to the ads at the bottom of the page. When ads are displayed at the bottom of the page, it increases the potential advertising space, making it possible to place more ads on page one, rather than when the ads are placed only above and alongside the search results. This too could have a major bearing on the overall performance of ad campaigns, as many users may scan only the first page of results.